Pry-Minister Annie Rabbit and Smokey Sunning Lagomorph would like to wish each and every one of you a very hoppy Val & Tiny's day. we had a very nice Valentine's day , and we hope you too . We had a lovely Val And Tynes Day. Mummy tried to take a photo of us when she came in from work but it was too dark in the dining room and we would not let her put the lights on - we were only having a little kiss or two but some times buns need a little privacy ,don't you agree? 2-foots have less sense than kits! Of course you need your privacy. 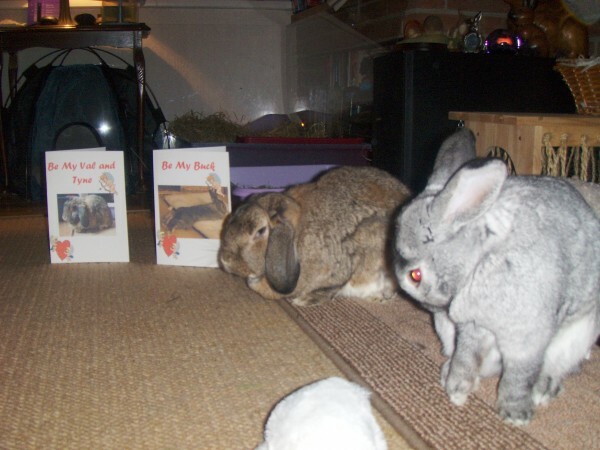 We don't bunderstand Val and tiny's day being two lady buns - but fank yoo anyway. Hopparently we bought Mummy a card to tell her that we loved her ... seems to have worked as we got a nice new willow ball to nom in return.